Back cover blurb: Drift down sun-bleached streets. Lose yourself in the California sound. Find beauty in a dirty bar. Love like your life depends on it. Carry on after the party stops. Believe in what you’re fighting for. Fall for Daisy Jones and the Six. Daisy Jones was born in 1951 and grew up in the Hollywood Hills of Los Angeles, California. The daughter of Frank Jones, the well-known British painter, and Jean LeFevre, a French model, Daisy started to make a name for herself in the late sixties as a young teenager on the Sunset Strip. Firstly - I feel I should confess, that I am a music (as well as a book) lover. So this book appealed to me the moment I heard about it. I also enjoy reading books where there are a lot of different opinions and you have to try and unravel the truth for yourself. Daisy Jones and the Six certainly has that. 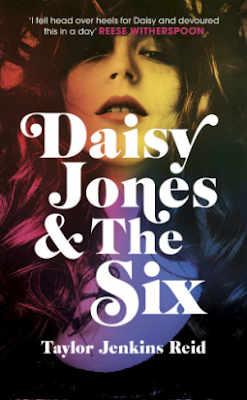 Daisy Jones and the Six is told from differing perspectives throughout the novel, from Daisy’s chaotic start in music and the grass roots of the band, through to the sell out tours and volatile album recordings. I absolutely love how the stories of both the Six and Daisy Jones' rise to fame are catalogued separately so the reader understands that they weren't always together - they were just always destined to be together. At the risk of sounding like a teenage fan girl - I actually genuinely loved Billy as a character. Him and Daisy are both in their own ways those tortured geniuses of pop stars that really do exist outside of this fictional world. In fact, lot of the time this novel reads like a band autobiography, the characters are that real. I would love to see this novel as a film, or TV show, because I need to hear those songs, to feel those songs that are so beautifully and brilliantly written. Daisy Jones and the Six is a must read novel for any music lover, and a pretty great novel all round even if you're not. Destined to be one of this years greatest hits. Daisy Jones and The Six is available now via Amazon online and all good book shops.